The New Garena Hack 3.3 is released by GarenaHack-er, this version has built in Custom Kick, Diabolic Warcraft 3 Toolkit and Warcraft 1.24b maphack. You can use this Garena Hack with any Garena update. There are no MEGA Exp in this Garena Hack, even the original one doesn't have it. Read the guide and download the Garena Hack v3.3 with Warcraft 1.24b maphack. 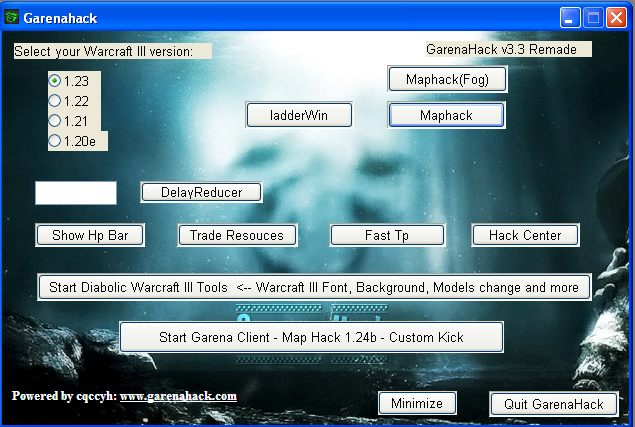 • Download GarenaHack_4.04_v3.exe from the link above. • Install it in your Garena Folder. • A pop-up will appear, just click "YES"
• A pop-up window will appear, click start..
• Another pop-up will appear, but this time you know what to do ^^. • GarenaHack.exe and Garena.exe must not be in same directory (it must be in a sub-directory), if you see this, delete the folder, and reinstall Garena & Garenahack. • There is no MegaEXP in this hack. • There is no virus in this hack, if your antivirus say anything, just disable it. • If any Garena update comes, * Update it normally but after the update, when the Garena client is started automatically again, close it, and the click "Start Garena" again from the GarenaHack. If you don't do this probably nothing will happen. But it's best if you do this. • If you still have any problem you can post a comment.